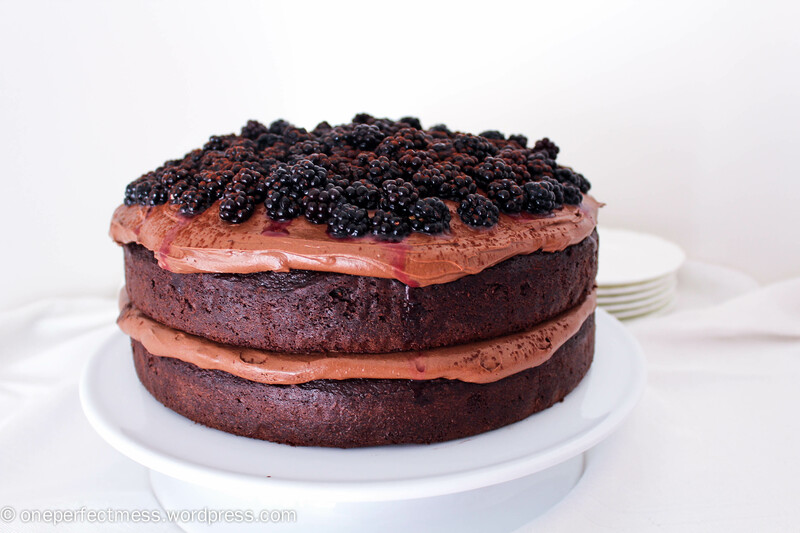 This is a monster for chocolate lovers; layers of rich, moist, chocolate buttermilk cake held together in a delicious embrace by a thick, velvety, dark chocolate cream cheese frosting, topped off with fresh juicy blackberries! The cream cheese frosting is decadent, but its slight tang provides the perfect offset to the rich, chocolatey sweetness of the cake itself. And I just love blackberries…I summoned my inner jungle girl and went crawling through a dense forest near my house to pick a whole container-full of these bad boys. I came back with some pretty severe war wounds down my legs and arms, but it was so worth it.